W e were pretty much all surprised by the announcement by Pope Benedict on Feb. 11 that he will resign. I am very sad that as of Thursday he will no longer be our papa as they say in Italian. He is truly the Servant of Servants, the Holy Father. He serves God as well as all Catholics and everyone in the world. He is an example of one who loves God, who prays deeply and with sincerity, who has a great knowledge of things holy and who loves all people. There are many more good things that can be said of him. Understandably, we will miss him. Most of us have no idea how taxing a Pope's schedule is these days. Perhaps a half century ago, a pontiff could get away with staying pretty much cooped up in the Vatican and could limit his appointments. Bl. John Paul II broke the mold and responded to present times by demonstratively acting as the pastor of the whole world. In addition to bringing the Gospel in person to many countries, he taught through encyclicals and apostolic exhortations, letters, interviews and books. Moreover, he had the responsibility of meetings with diplomats, religious leaders and pilgrims. Pope Benedict apparently did not want to curtail the demands of his office in these times. We also know that he wanted the Church to be conversant with the current means of communication. He encouraged the use of blogs, facebook and twitter  all for the purpose of sharing the truth of the Gospel. His decision, I believe, is motivated by love. He loves God above all and also all of Gods children. He does not want the Gospel message to be impeded in any way, particularly not by his lack of physical ability. He entrusts the papacy to God  to the work of the Holy Spirit, realizing that a physically strong pontiff will be able to do so much more to get the truth to everyone everywhere. 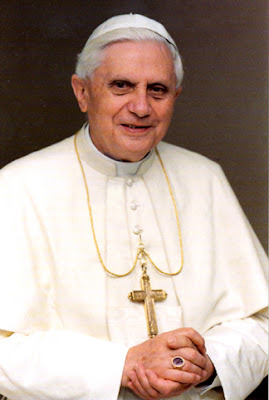 Oh, yes, we will miss our dear Pope Benedict. We thank God that he served us for these eight years as our papa. May God always protect him, and may Our Lady watch over him. Thank you, Papa Bene, for your dedication and continued service to the Church. As you pray for us, you will be in our prayers as well.